Compare Microwave Potato Chip Makers: Why Choose a Mastrad? We all like our potato chips. But we also don't like the adverse health effects that are associated with overeating them. These health effects are mostly due to the fats absorbed by the chips as a result of deep frying. If we don't deep fry and prefer buying already sliced chips that can be cooked in the oven, or if we prefer buying ready chips in paper bags, then we also absorb various chemicals used as preservatives and taste enhancers that are added to commercial products. We know that deep fried or commercially prepared chips are not healthy, but we still eat them as we think there is no other way to enjoy our potato chips. Well, there is another way to enjoy healthy chips: it is by preparing them from scratch and in your own microwave oven! The technique for that is quite simple, and it usually takes a few times to perfect it by adjusting parameters such as quantity and temperature. But once you've got it, you can prepare healthy and delicious chips in minutes. Chip maker kits that facilitate the preparation of microwave chips from potatoes as well as from other suitable fruits and vegetables such as carrots and bananas are commercially available. These kits usually include a mandolin set for slicing and a tray for the cooking. Some brands allow for interlocking trays that enable the use of multiple trays all at once to cook more than one serving at a time. In case you may want to buy your own microwave potato chip maker kit, you will find below a description the MASTRAD chip maker which is the most popular, as well as suggestions for other less popular brands. The Mastrad A64601 comes with one chip making microwave tray and a easy-to-use mandolin set as seen in the picture (with holder and slicer). It is made of premium silicone, and it allows vegetables and fruits to crisp up without use of fats or oils. It offers the interlocking tray feature that allows the use of multiple trays at the same time to cook more than one serving at a time, and it is dishwasher safe. To use, you simply have to slice the potatoes or other fruits and vegetables thinly and evenly using the mandolin. Place them in a single layer on the chips tray, and microwave according to enclosed directions. When done, season with your favorite topping and you have a healthy and delicious snack that you will not regret eating or serving your children. As mentioned, you can stack multiple trays to cook more than one serving at a time. This feature can be used for kids to experiment and try different vegetables and fruits. The Mastrad Top Chips maker measures 10.9 by 1.1 by 10.9 inches and weighs 9 ounces. It is therefore usable even with the smallest of microwaves. Note that additional trays can be obtained (see the MASTRAD A64501 product below in Amazon products section) so you can use the tray interlocking feature to cook more than one serving of potato chips at a time, or different varieties such as carrot or banana chips. Most other brands of microwave chip makers usually come with a vegetable slicer, a vegetable holder, and a cooking rack or one or more cooking trays. These products are made of durable plastic and are usually dishwasher safe. To use, you simply hold the vegetable or fruit with the holder, slice it thinly with the slicer, take the slices and place them into the slots of the rack or on the tray (depending on whether the product comes with a tray or a rack), and then microwave according to directions. Note that unlike the Mastrad chip maker, these other products do not allow interlocking of multiple trays in order to cook simultaneously more than one serving of potato chips or different varieties of chips. So which microwave chips maker to get? 1The MASTRAD trays are made of silicone as opposed to the other brands' trays that are made of plastic. As a low-taint, non-toxic material, silicone can safely be used where contact with food is required, and silicone is fast becoming an important product in the cookware industry. On the other hand, with plastic there has been some concern that food may absorb some of the plasticizers used in plastic, particularly at high temperatures when microwaving. Therefore, even though the plastic used in the other brands' trays is no doubt of high quality, we prefer a silicone product over a plastic product. 2The MASTRAD trays come with a mechanism that can be used to interlock multiple trays to make larger quantities of chips. You can even purchase a two-tray model (please see below). 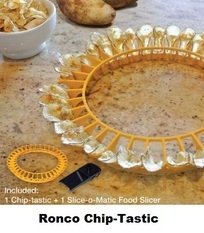 That may become a critical feature when you need to prepare chips during a party for a number of people. This feature is not offered by the other brands. 3Amazon buyers have expressed in their reviews a higher satisfaction level with the MASTRAD chips maker as they were able to perfect their ability to prepare the perfect chips in less time. For the above reasons, when you compare microwave potato chip makers, we recommend the MASTRAD even though it is slightly more expensive than the other brands. Important Tips: The chip maker should not be used to cook foods with high fat or sugar content. It should not be used on stove-tops or in conventional gas or electric ovens. For better results, you should slice your potatoes about 1/16" (2mm) thick. These products are all dishwasher safe, but for stubborn stains wash with a soap and water solution and not with abrasive detergents. Please click the products below to check their price. These products usually come with FREE shipment in the US.